India is one of the most fascinating places in the world for its stunning landscapes and vibrant culture, and in addition to Delhi, Mumbai and Goa, there are some small historical gems like Kochi where it’s definitely worth spending a few days. Its tranquility and international character may even make you forget that you’re in India. Kochi, or Cochin, is a southwestern Indian city with an interesting history. For centuries it has been one of the most important Asian harbors for spice trade and therefore a strategic point not only to the neighboring Arabic populations, but also for the European settlers – Portuguese, Dutch, British – from the 16th to the 18th century. Traveling in India might not be that easy, especially in big cities where the metropolitan hustle in combination with the incessant noise from car horns and passing traffic can be a bit chaotic. In this sense, Kochi is a kind of oasis where you can take a much-needed break and breathe. Here you can find the perfect place to relax and completely recharge, in a Ayurvedic center with a professional massage before continuing on the rest of your journey. Kochi is also one of the most important airports in the south of India and many flights going to the Maldives or Sri Lank stop here. Walking through the streets of Fort Kochi is like walking through the streets of a northern European city. It’s European colonial past left a tangible impression on the city, especially on the architecture of the palaces and buildings. Today, in the Fort Kochi area, all houses that once belonged to the settlers have been transformed into elegant hotels. The fort built by the Portuguese to protect the factories from Arab attacks was almost completely destroyed by the Dutch when they conquered the city, but part of it is still visible. This is the most toured area, full of little shops and restaurants that serve beer, which is banned in most places in Kerala. The fort is also known for the presence of Chinese fishing nets that can be seen along much of the landscape of the city to the point of being the main focus of most of its postcards. 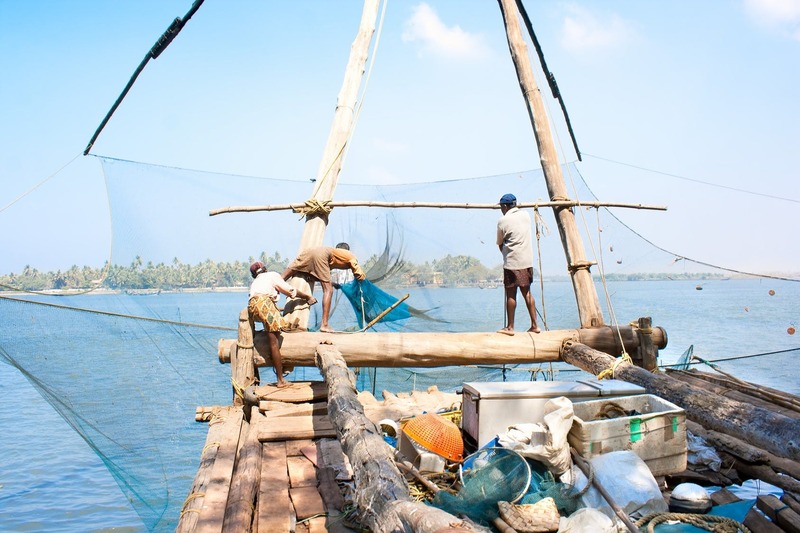 These fishing nets are present throughout the area surrounding the town, but in Fort Kochi you can see them up close, take pictures and, perhaps even help the fishermen check how much they caught and lift them from the water with the help of a pulley system. In this case a tip is appreciated, but not mandatory. 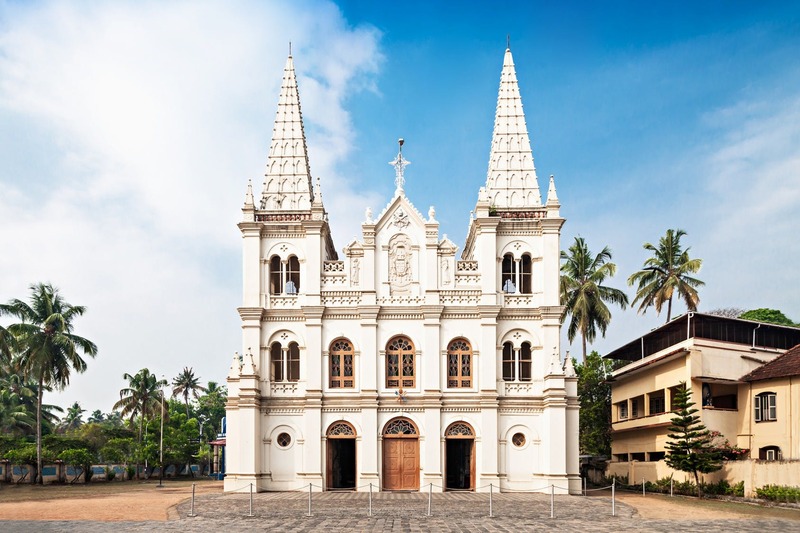 The St. Francis Church and Santa Cruz Basilica are two of the oldest churches in the city and date back to the sixteenth century when the Portuguese arrived in Kochi. Subsequent rulers contributed to their conservation and restoration, keeping them in perfect condition. The St. Francis wooden and clay church was built by the Portuguese in 1503, this is also wgere the navigator Vasco Da Gama was buried, his tomb is located in the east of the church. The Santa Cruz Basilica is rather surprising for its grandeur, richness of its decorations and the details that characterize the external facade and the interior. Contrary to what one might think, the Dutch Palace in Mattancherry actually has very little in common with the Dutch. In fact, it was built by the Portuguese and given to Raja who allowed for an open trade route with Europe. 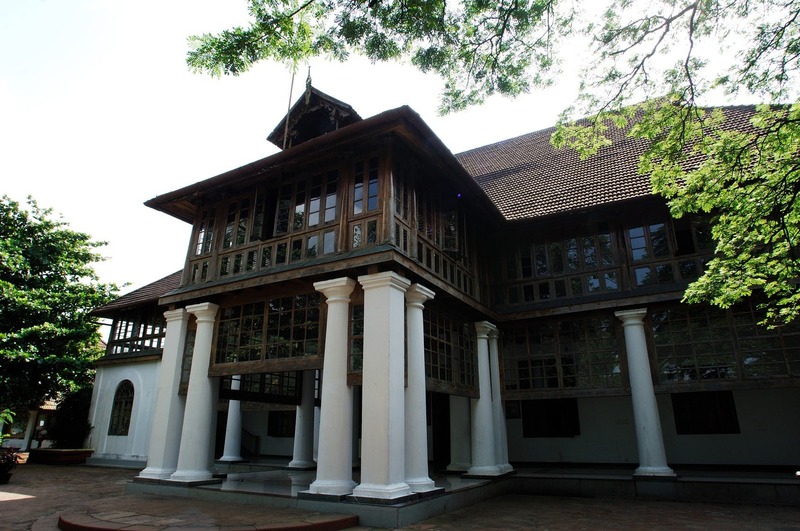 When the Dutch arrived in Kochi they restored the building for the Raja. Wooden coffered ceilings, demonstrating the skill of the craftsmen, characterize the interior of the palace; the walls are decorated with traditional scenes painted in the five colors of the traditional art and culture of Kerala. The designs are complex and tell the story of Ramayana: from the Dasaratha sacrifice to the return of Sita from Sri Lanka after his release. India is full of rich stories and legends that place gods as protagonists, characters who reincarnate and the interpretation of mystical symbols, so it is essential to be accompanied by an expert guide to better undertake this fantastic journey throughout the discovery of this fascinating culture. The synagogue of Kochi was built in 1568, when large numbers of Jews poured into India in search of shelter from persecutions that bloodied their land at the time. Here, in the Jewish Town district, they built their homes and the synagogue where they gathered to pray. The floor of this sacred place is completely covered with small square tiles, coming from China and decorated by hand, while the ceiling is decorated with numerous chandeliers from Europe. Today, only five Jews remain in the Jewish Town. The old houses, spice stores and antiques are now pleasantly animated by smiling Indian people who welcome tourists with a wide variety of handicraft pieces and souvenirs of all kinds. One stop of the tour takes us to the laundry room that is truly a point of great interest because it is still functioning and remains faithful to the rules of Indian tradition. Just past the entrance you can see men and women struggling with heavy irons heated by hot coals of coconut wood, while on the left are where the dryers are placed, fundamental during the monsoon season when it is not possible to lay clothing in the open air. Continuing on, there are small cubicles with running water tanks where the “violent” washing takes place; referred to as violent because the cloths, once soaped, are thrown with force against stone to subsequently be rinsed. Finally, unfolding before your eyes is a seemingly endless landscape of colorful clothes hanging out to dry.